Lawyer Hakim Peker and Gurkan Istekli who were taken into custody on November 14, 2017, have not been either referred to court or been released yet. Under state of emergency rule, custody term can be extended up to 14 days. Lawyer Yaprak Türkmen and intern lawyer Buket Yılmaz who are members of People’s Law Office and Progressive Lawyers Association that was shut down with an emergency decree, were arrested on 20 and 22 December. Thus the number of lawyers who have been raised since 15th July raised to 570. Presently, 19 lawyers of the People’s Law Office have been under arrest. 32 lawyers including the president of Usak Bar Association who protested chief prosecutor of the city because of the insufficient parking lot in the courthouse were indicted. Ten years imprisonment is being sought for lawyers. In 2016 June, lawyer Feride Evran who was in a hurry to reach the hearing in time has parked her car in a section that was reserved for judges and prosecutors due to the insufficient parking lot. But Uşak Chief Prosecutor has the car of lawyer Evran towed away, in response members of Usak Bar Association protested Uşak Chief Prosecutor in the courthouse. 18 months after the incident 32 lawyers including the president of Usak Bar Association lawyer Gurcan Sagcan who attended the protest action were indicted by Usak Prosecutorial Office and up to 10-year imprisonment was requested for them. 9 books including Father Goriot and Martin Eden sent to lawyer Engin Gokoglu who has been kept pretrial under detention in Tekirdag Prison since 20 September, were prohibited for security reasons. Lawyer Engin Gokoglu was arrested on 20 September, 2017 along with 13 other lawyers was subjected torture at the prison located in the province of Tekirdag. There has been a relentless campaign of arrests which has targeted fellow lawyers across the country. In 77 of Turkey’s 81 provinces, lawyers have been detained and arrested on trumped-up charges as part of criminal investigations orchestrated by the political authorities and conducted by provincial public prosecutors. 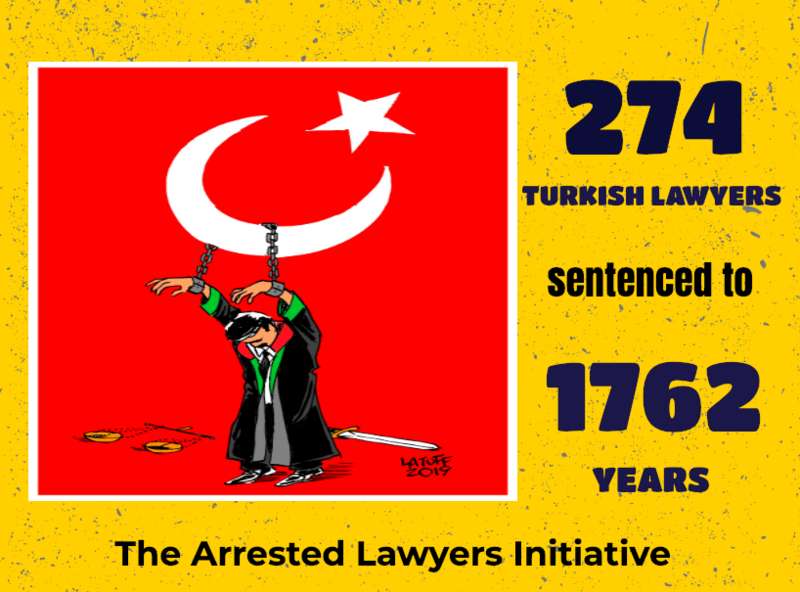 As of today, 570 lawyers have been arrested and 1486 lawyers are under prosecution, 71 lawyers were sentenced to long imprisonment. Some of the arrested lawyers were subjected torture and ill-treatment.